It’s just a little ditty that we grew up on, a little rhyme to remember a few facts. Columbus took to the ocean to find a better trade route to distant lands. A big aid for the explorer were his three ships: The Nina, The Pinta, and the Santa Maria. The Santa Maria was the largest of the three, and served as Columbus’ flag ship. With a tonnage of 150, and a length of 63 feet, it was a serviceable vessel and made the travels to the new world well. The Pinta—not as small as the Nina, not as large as the Santa Maria—was the fastest of the trio. Nina, Spanish for “Little Girl”, was the smallest of the three, and by and large Columbus’ favorite ship. He adored it and now, internationally know scrimshander Linda Karst has worked her magic to memorialize this nautical piece of world history that is so important to our own. While a colorful depiction of the Nina on the open seas would be enough for a memorable design, Karst has went above and beyond and included the name of the Captain Vicente Pirzon, a record of the location of his departure and the date, and lastly to complete the image, there is the symbol of the Spanish King Ferdinand, who helped immensely with the funding for Columbus’ voyage. Karst is pretty unique in the field of scrimshanding. Done in the traditional handmade style without machining, her stuff really stands out and shines, and has since 1972 when she took her first tentative steps forward to become a full fledged scrimshaw artist. 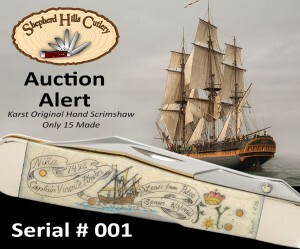 She’s one of the premiere artists in her field, being tasked to do such illustrious work as scrimshaw for Johnny Depp’s “The Lone Ranger”, or commissioned by Brad Pitt to make a scrimshaw designs on a knife for Quentin Tarantino as a thank-you after the film “Inglorious Bastards” debuted—and that’s just the tip of the iceberg. With such a pedigree of talent, ability and international renown, having one of her pieces of art on the scale of a Case knife—well, it’s gonna be hard to beat a combo like that.